we announce full of enthusiasm that the 4th AIDP YOUNG PENALISTS SYMPOSIUM is comming soon. We extended the deadline for submissions to 30th May 2014. To facilitate your own organization, as soon as possible we will send you the Notification of Acceptance. Bellow you will find attached the CfP. We are also preparing a profile in Facebook ( AIDP Young Penalists – 4th Symposium ) to make our communication easier. The challenges that came along with the financial crisis and the recent transformations in the world economy set a requirement to rethink the role of criminal law. New efforts are needed to comprehend the dynamics of criminal law, its usefulness, but also its potentially severe and long-lasting damages to individuals, to corporations and to the society as a whole. In this context, regulating mismanagement in the corporate field appears as a complex issue. How can criminal law deal with organizations; how can criminal law lead to risk reduction in corporate behavior and thus regulate the economy? What are constitutional limits to dogmatic and legal innovations like imposing limits to financial transactions, or to the theory of respondeat superior? For all these reasons, classical principles and theories of criminal law – such as the notion that criminal law may only protect (individual) legal interests – need to be put into question. Moreover, the debate on regulating mismanagement in the corporate field suffers from lack of empirical analyses and investigations on the effectiveness of economic criminal regulation and its impacts on society. Sanctioning of corporations is still a controversial issue in some States. In others the debate is concentrated on the extent of the criminal law enforcement, as complementary to self-regulation and civil law enforcement and to administrative law enforcement. Also in the area of criminal procedure and judicial cooperation in criminal matters there are important discussion points. To which extent do human rights apply to corporations? Are they entitled to specific procedural guarantees? Have they the right to protection against concurring jurisdictions to investigate, prosecute and sanction? In practice several corporations are facing multiple punitive proceedings under US jurisdiction and several national EU jurisdictions for this misbehavior in the financial markets (examples: Libor/Euribor). PhD students, post-docs, young academics and other young penalists are invited to submit an abstract (length: 150 – 250 words) in English on these and comparable aspects on “Regulating Mismanagement in the Corporate Field: The Role of Criminal Law and the Financial Crisis” via e-mail (aidpyp.4thsymposium@gmail.com) by 14th April, 2014, along with contact and affiliation information. Decisions on individual submissions and interventions can be expected in May 2014. Authors of accepted abstracts are invited to present their work in one of the panel sessions; after each presentation of 10 minutes a short discussion will follow. The use of presentation technology (e.g. power-point) is optional. Authors of accepted abstracts are furthermore invited to submit a written version of their presentation (length: 2.000 – 5.000 words including references), which – if finalized and submitted to the organizing committee by August 15th, 2014 – will be published in the conference proceedings in book form. Participation in the symposium is free of charge. Travel and accommodation expenses cannot be covered by the hosts. Depending on funding, we may be able to offer partial travel sponsorships to outstanding participants and/or participants from developing countries. 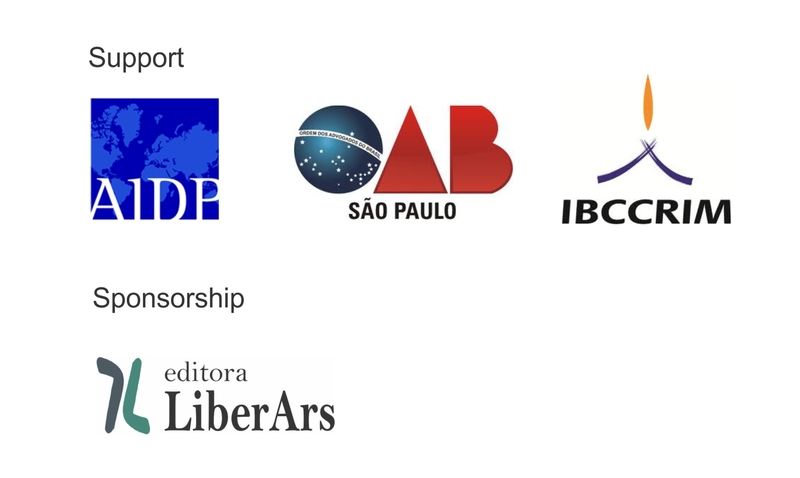 If such a sponsorship is decisive for your participation in the symposium, please let us know when submitting your abstract or – at latest – by April 01st, 2014.We thank the Brazilian Bar Association – Section São Paulo (OAB/SP – Ordem dos Advogados do Brasil – Seccional São Paulo), IBCCRIM (Instituto Brasileiro de Ciências Criminais) and the Brazilian National Group for offering us institutional support.